We are part of one of the coolest, most creative, and intellectually vibrant ecosystems on Earth. Our campus is situated in Kendall Square, a hub brimming with technology giants, biotechnology firms, and startups. Ever evolving, the plans to develop our neighborhood are next-level cool. But we aren’t all engineering and no play. Our campus is a mere 364.4 smoots (plus or minus one ear) across the Charles River to Boston, where foodies can indulge, sports fanatics can cheer, and history buffs can walk the streets of Paul Revere. We are also only a subway ride away from the beach and a short road trip to the Green Mountains or the White Mountains. The bottom line: this city has something for everyone. We encourage you to come check it out for yourself. 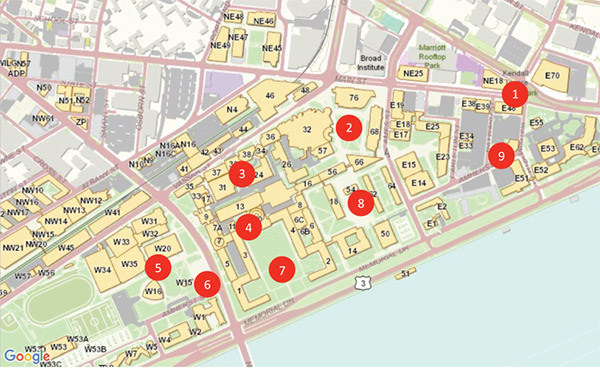 In the spring of 2017, the MIT School of Engineering dean’s office teamed up with the CommLab and some of their graduate student fellows to create the first-ever audio tour of the MIT campus. We had a few ideas about where to go and what to say. The students, of course, had better ones. We had a lot of fun putting it together. The tour was designed to start in Kendall Square and move in a rough circle around campus — but it doesn’t really matter where you start or stop. The dots on the map are rough approximations of where you should stand while listening but feel free to wander and browse at your own pace. In true MIT style, the creation of this tour is a learn-as-we-go experiment. We really want to hear back from anyone who listens to it. After you have completed the tour, please take our survey about your experience. Remember to take our survey about the tour! The Office of Admissions conducts information sessions followed by student-led campus tours for students, families, and groups. There are also opportunities to prospective students attend a class, shadow a student, or join a student for lunch. If you’re interested in majoring in electrical engineering and computer science, email Anne Hunter or Vera Sayzew a few days prior to your visit to schedule a tour. If you interested in majoring in aeronautics and astronautics, please contact Marie Stuppard two weeks prior to your visit to make arrangements. Tours are given from 1–2 p.m. on Mondays and Fridays, excluding holidays.